Have you ever stopped doing something you were good at? Have you ever stopped doing something you weren’t so good at? I’m most bothered by the things I stopped doing that I was good at. Here are my three. Basketball: I remember Saturday nights as a child playing ball in our driveway with my sisters in our nightgowns, while Dad was grilling steaks + Mom was fixing the rest of dinner inside. Certain cracks in the concrete marked our spots for “Around the World” as well as the slightly off centered free throw line. Dad would pause from grilling duties and get scrappy with us while we dribbled, which made me a better player. Then he’d swing me around as the laughter would ensue. I loved those Saturday nights. To this day, swishing a 3-pointer gives me a high like no other. I loved stealing the ball from an opponent. I was a hustler. Aggressive for the ball. Absolutely loved playing. I stopped after high school. I’ve often wished I played as a young adult even in a church or rec league. On the 2nd anniversary of my Dad’s passing, I went outside in the middle of the afternoon all alone. 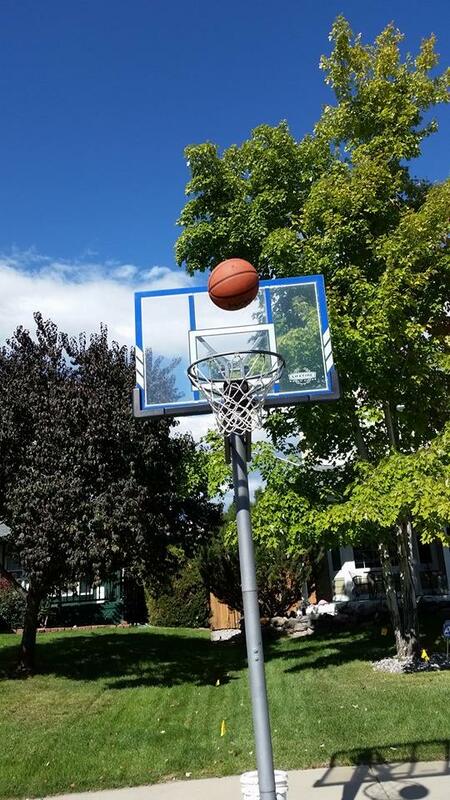 I shot hoops in our cul-de-sac. I actually had my phone and took a picture after the release of what became a swisher. I smiled + cried at the same time while saying in my heart and out loud to the empty streets while the wind whistled in the air “That one’s for you, Dad. All net.” He was my coach. Want to know something weird? As an adult, I’ve had recurring dreams of feeling panicked, being in a game and not being able to dribble correctly. Not able to shoot the ball. Unable to lift my arm. The truth is, I love dribbling and, in fact, the drills. I can still sink a shot. What happened in my dream? I was paralyzed by the fear of not doing it right. 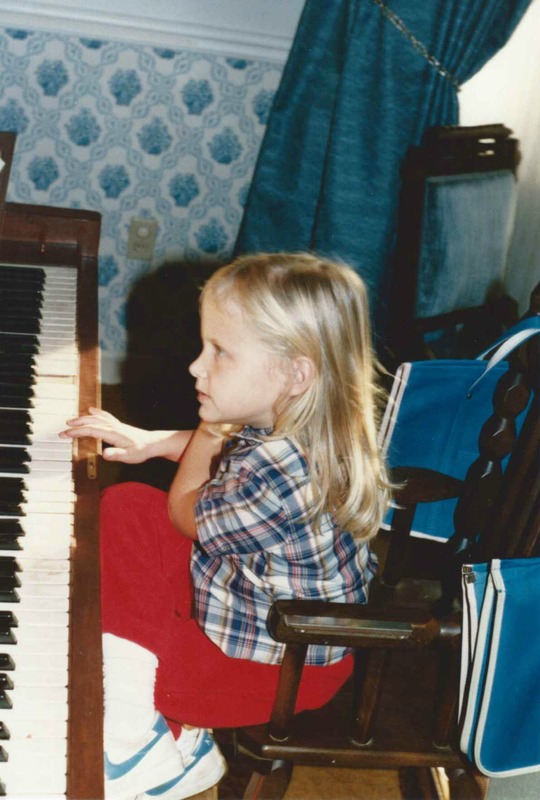 Playing the piano: My Mom and my Nana spent countless hours taking us girls to Yamaha Music School for our piano lessons. It’s one thing I’m most appreciative for now as an adult. I’m grateful my Mom allowed me to choose songs I wanted to play in recitals instead of the traditional pieces we had to learn in class, and what seemed like everyone else was playing. Mom has always encouraged me to stay true to me, and I’m grateful to have her influence on my life. Parents, never underestimate how far your belief in a child will take them. In 4th grade, I remember the rest of the kids choosing eloquent classical music for their performance in our Spring recital. Although beautifully composed, they were so boring to me. Mom knew what I wanted to play, and got the sheet music for me. With every ounce of confidence I walked out across the stage, sat down and tickled the keys to “Total Eclipse of the Heart”. I was 9 years old. The shade of my sheet music’s cover? I can still remember it to this day. It was lavender – my favorite color. Everyone thought the song choice was so bold, but I didn’t. I wasn’t trying to be bold; I was being me, and that moment being me meant not doing what everyone else was. One song I still play by memory is Stand By Me. I learned it in elementary school, and that’s also when I stopped taking lessons. My skill level is still that of a pianist my children’s age. I will hear a song and can play it by ear, although very basic. I used to have a book of Journey’s greatest hits – Open Arms and all! Wish I still had that and my Alabama one. From classical hymns to Christmas music to Dixie, I often play to an audience of one: me. Why? I get nervous and mess up when others are listening. And I don’t like messing up, much less when someone can hear me. It’s a perfectionistic tendency I acknowledge and own, but regardless it’s still there. I am paralyzed by the fear of not doing it right. Earlier this year, Ben E. King passed away. I discovered the news on Twitter and was home alone. I immediately went downstairs. Took my phone out to record, and started playing his song. Music has always resonated with me. I become drawn in by lyrics and lost in the song. I wanted to write about it that day, but I didn’t. I didn’t quite know what to say until now. This video is my first take, unedited. Promised myself I would record it once and only once…and that one day I would share it when I knew why. Here’s my moment. Have you ever read The 5 Love Languages? If you haven’t, buy a copy. And if you’re a parent, read The 5 Love Languages for Children. I promise you it will be time well spent and your relationships with those most important to you will flourish from what you learn. One of my love languages is Words of Affirmation. Looking back over my life, I can see this pretty clearly. I keep notes and letters that should have been long thrown away. I keep cards so I have the handwriting and sentiments of love ones no longer able to send them. I want to write. I’ve become so timid in the process, that I’ve fallen short on sending thank you notes, birthday cards, and hand-written words of encouragement in the mail that truly used to feed me and I hoped fed others. Plus, I view sending thank you notes as showing good manners. 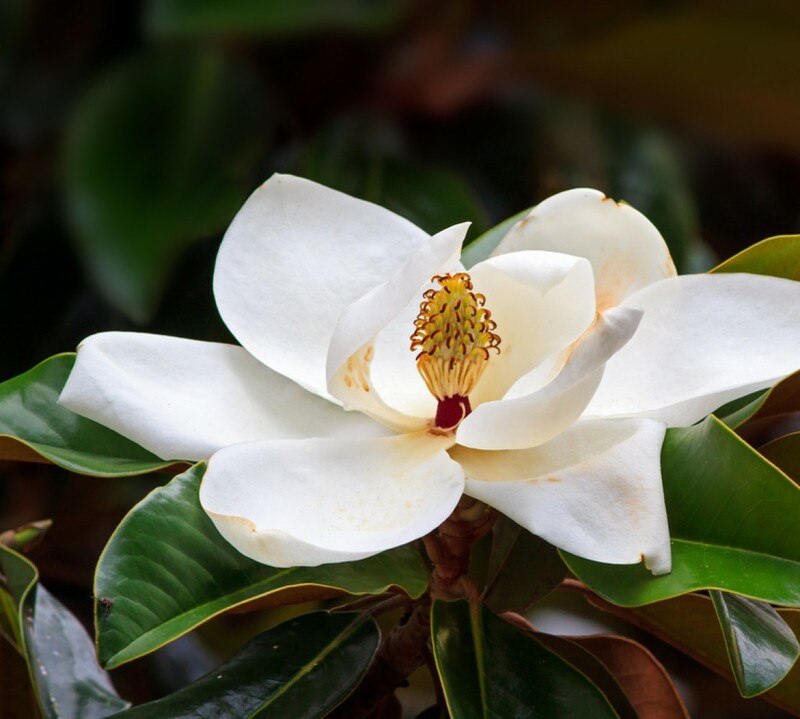 I use words to encourage others…I was a cheerleader…still am in many ways…a nurturer…I try to always find the good in someone, and sometimes share it out loud with them. Not false praise, but just like there’s always something to be thankful for [1 Thessalonians 5:18], I believe there’s always something good in everyone. To me, that verse does not mean we give thanks for everything that happens, but in everything that happens we can find something for which to be thankful. There’s a difference. So with people, I believe that even though someone can be mean or make horrible choices, there is some good thing in them. I feel that so often we hear what we’re not good at, and I’ve been guilty of this with myself as well as with others. What I’ve found is when we lift others up with genuine words of encouragement…not flattery…that person may be inspired to do small + big things. They may even go on to make a positive impact for someone else in their own way. My daughter often asks me “Why do you talk to strangers?”. I tell her it’s just who I am. Honestly, I find people fascinating. I simply love conversation. Everyone has a story – a different story from you + from me. I’ve noticed over the years that people just want to be heard and listened to. How do we validate others? Listen to their stories. We don’t have to agree with them. We don’t have to fix them. Don’t have to share the same point of view, political party, or religion. Just share time in their space. After all, it’s at the nature of who we are to live in connection with one another. Want to do this in a small way? The next time you ask someone how their day is going in passing, actually wait to hear the response! Have you ever found it easier to not do something because you think you may get it right? Then what? I think this boils down to a fear of success. A lot of times I hear people say, “what if I fail.” Well, you might. I might. So what? Then you know. And what if you fly? What if it takes off? I’ve been scared of that before. Apprehensive to walk back through parts of the muddle that on the other side, made me become who I am. Even if only going over things in my mind, not even sharing to anyone else directly, I’m concerned over how to phrase in certain ways not to hurt someone’s feelings or be disrespectful to their story, no matter how theirs may have impacted + in turn molded part of mine. Not to dissect the past, but through it help to be purposeful + present in the now. Maybe in even a small way shine some hope for someone else’s future. I’ve asked myself does anyone really care what I have to say, why does my viewpoint matter, and will anyone besides my sister read it? Whether by humor, vulnerability, or just sharing the stories of life, will my words positively impact someone…anyone? I’m a recovering people pleaser. Perhaps not so recovered. I’ve become so paralyzed that I’ve stopped doing one small, tiny, seemingly insignificant thing that I used to love to do, and I’ve realized it’s enveloped in a much larger paralysis. Want to know what it is? Writing notes. It sounds so silly! I’ve stopped writing little notes because what I’m really scared of writing is a much bigger story. Writing is my #3. So, I’ve made a promise to myself. I’m going to spend time daily penning my thoughts to paper. Some I’ll share, some I’ll keep tucked away until I know just what to do with them. Some of those will only be known by me + my Savior. Regardless, I will move forward. Friends, will you ‘stand by me’? Think of what you’ve been good at, something you used to enjoy. Do one small thing towards something that’s made your heart smile before. Whether it’s going out in the cul-de-sac and shooting hoops, to writing words of encouragement either in a note, a post-it in your kid’s lunchbox, or drafting a book, to playing the song that’s been in your heart all along.